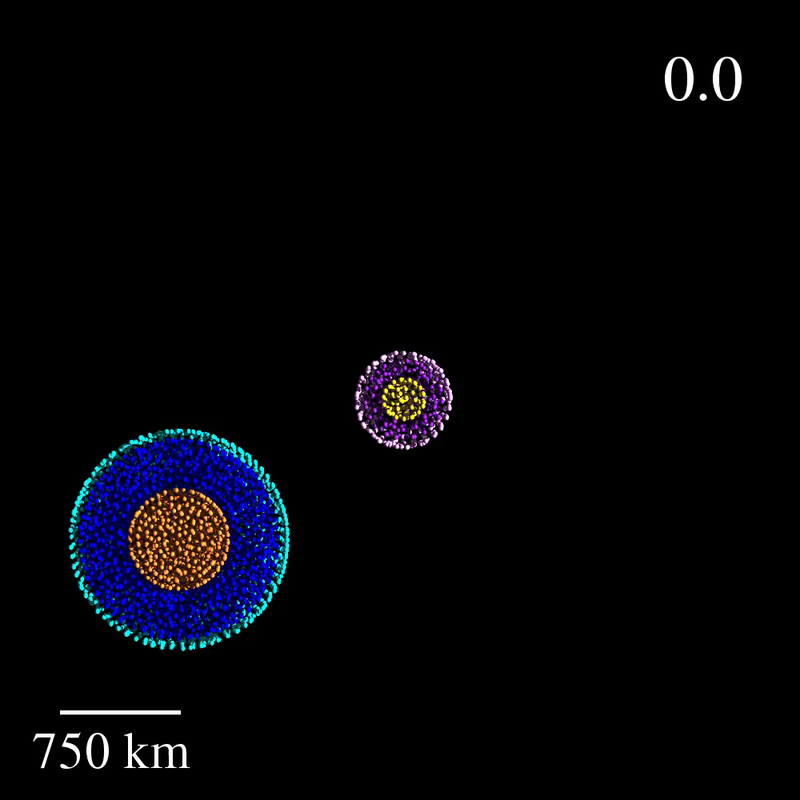 Figure 4a: Partial accretion collision between planetesimals with radii of 250 km and 170 km (mass ratio 0.3), at an impact velocity of 0.5 km/s (1.2 v_esc) and impact parameter of 0.25. The numbers indicate the time in hours from the start of the simulation. The target’s core, mantle and crust are coloured orange, blue and cyan; the projectile’s are coloured yellow, purple and lilac. Only SPH particles below the equatorial xy-plane are shown. The view is centered on the largest remnant. 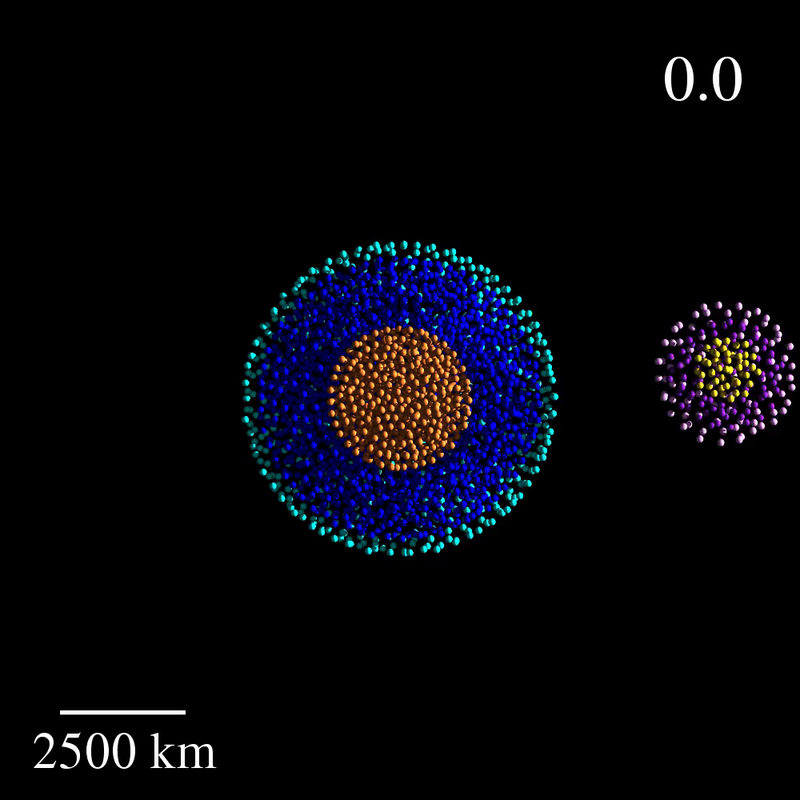 Figure 4b: Erosive collision between planetesimals with radii of 250 km and 170 km (mass ratio 0.3), at an impact velocity of 1.9 km/s (4.5 v_esc) and impact parameter of 0.4. The numbers indicate the time in hours from the start of the simulation. The target’s core, mantle and crust are coloured orange, blue and cyan; the projectile’s are coloured yellow, purple and lilac. Only SPH particles below the equatorial xy-plane are shown. The view is centered on the largest remnant. 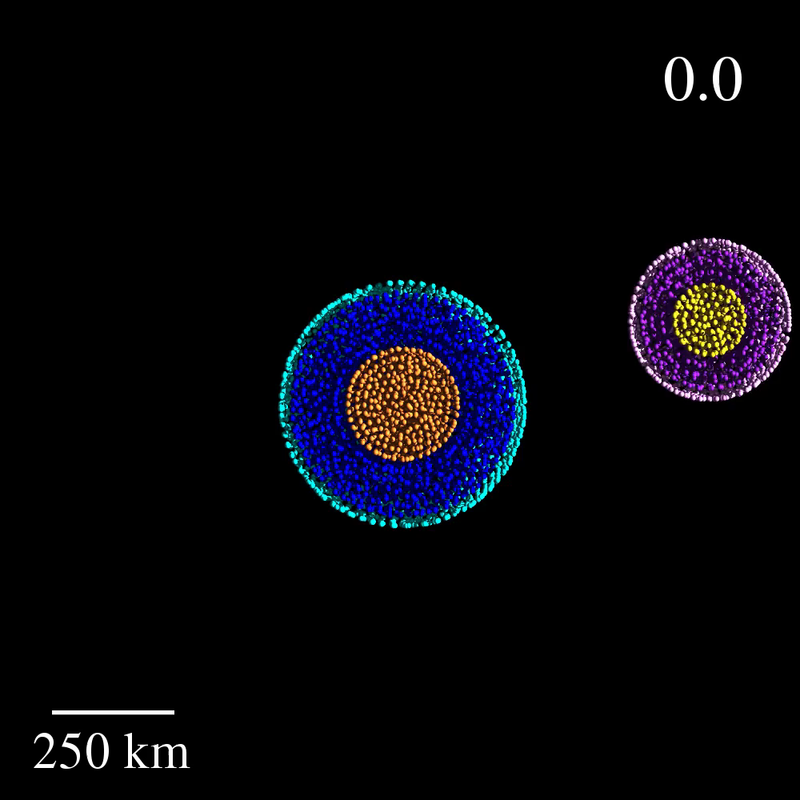 Figure 4c: Erosive collision between an embryo with radius 3160 km and a planetesimal with radius 1470 km (mass ratio 0.1), at an impact velocity of 24.1 km/s (5 v_esc) and impact parameter of 0.1. The numbers indicate the time in hours from the start of the simulation. The target’s core, mantle and crust are coloured orange, blue and cyan; the projectile’s are coloured yellow, purple and lilac. Only SPH particles below the equatorial xy-plane are shown. The view is centered on the largest remnant. 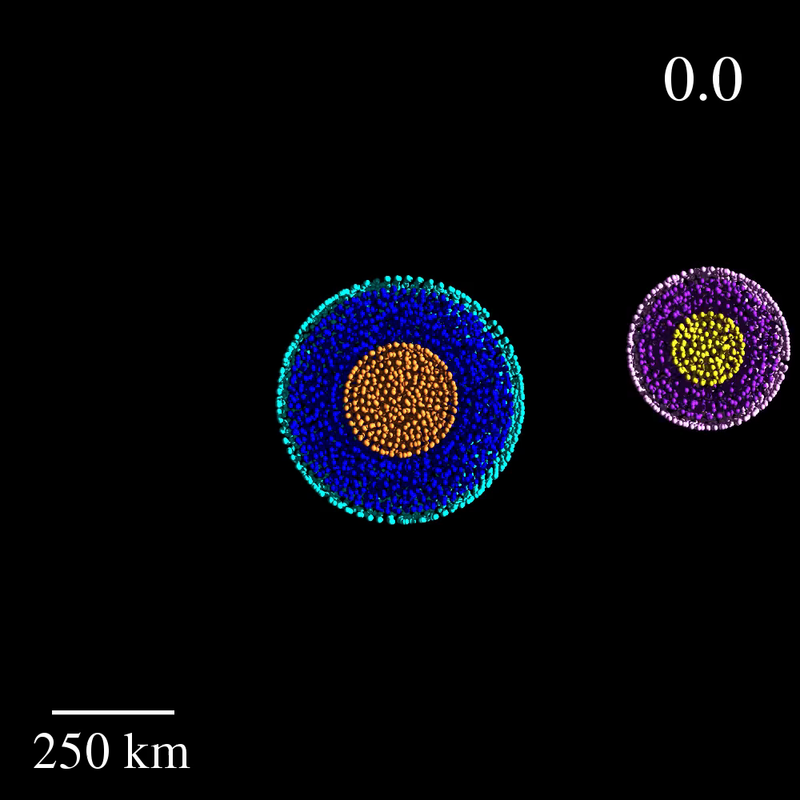 Figure 4d: Supercatastrophic disruption due to collision of planetesimals with radii of 250 km and 170 km (mass ratio 0.3), at an impact velocity of 3.8 km/s (9 v_esc) and impact parameter of 0.4. The numbers indicate the time in hours from the start of the simulation. The target’s core, mantle and crust are coloured orange, blue and cyan; the projectile’s are coloured yellow, purple and lilac. Only SPH particles below the equatorial xy-plane are shown. The view is centered on the largest remnant. 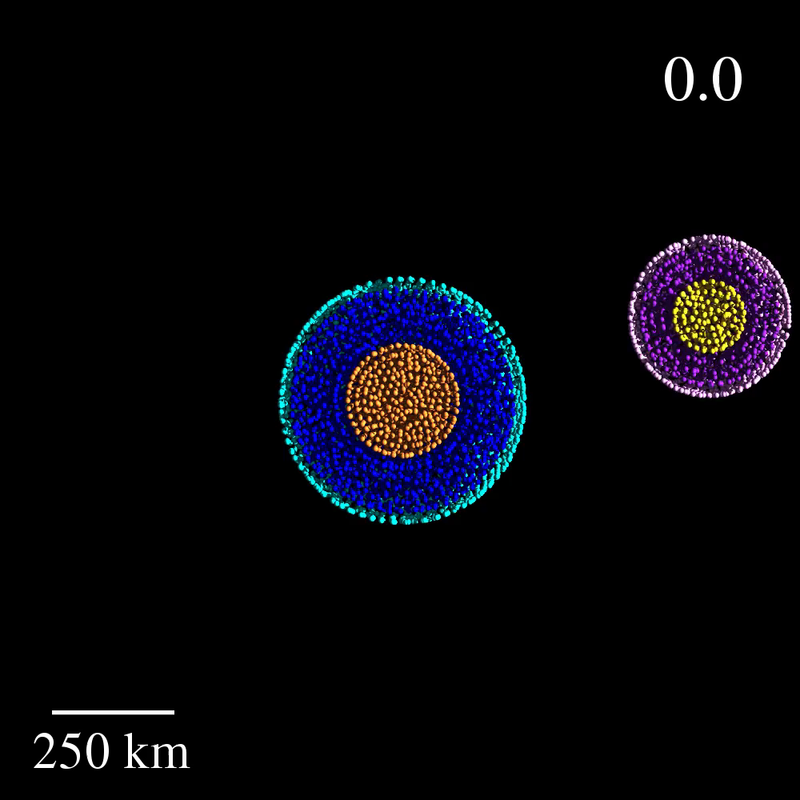 Figure 4e: Hit-and-run collision between planetesimals with radii of 680 km and 320 km (mass ratio 0.1), at a velocity of 3.2 km/s (3 v_esc) with an impact parameter of 0.8. The numbers indicate the time in hours from the start of the simulation. The target’s core, mantle and crust are coloured orange, blue and cyan; the projectile’s are coloured yellow, purple and lilac. Only SPH particles below the equatorial xy-plane are shown. The view is centered on the remnant of the projectile.